The Traveling Tripod: Monster trucks have got nothing on this beast - tires bigger than your hot tub!!! Monster trucks have got nothing on this beast - tires bigger than your hot tub!!! If the mud-jumping trucks at the county fair are called 'monster trucks' then the tires on this bus must earn it the title 'Godzilla of Buses.' 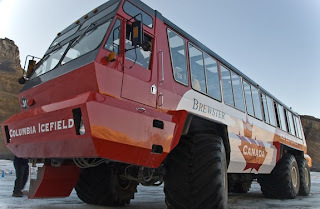 Where else are you going to get a chance to ride a passenger bus with tires that stand almost 5 feet tall? Relatively half way between Lake Louise and Jasper, Alberta, the Athabasca Glacier continues its journey down the Columbia Icefield and mere mortals can drive over its sometimes vertical surfaces. That is, if you take the "Ice Age Adventure" tour in one of their specially outfitted luxury SnoCoaches. The drive north from Lake Louise couldn't be easier. Go north on the Icefields Parkway - that's it. One road all the way. Sounds boring, but the scenery is breathtaking the entire trip. Download a free, complete travel guide for the parkway here. Read the whole article here at Examiner.com.